The season is definitely off to an interesting start. So today the Rangers debut of Lance Lynn, facing off against Cole Hamels, and thus we have an evil form Cardinal pitching for the Rangers against beloved forms Ranger and hero of 2015 Game 162. What is it that Tepid says baseball exists to do? Lynn has issues with his command within the strike zone, and while he fanned 5 and walked no one in 5.2 IP, he allowed 10 hits, including in Kyle Schwarber home run for the second day in a row, and ended up getting dinged for 7 runs, thanks in part to Jesse Chavez allowing inherited runs to score while not retiring anyone in relief of Lynn. Bird retired a pair of batters in the 7th then allowed a pair of runners before giving what to Chris Martin, who was asked to protect a two run lead. Alas, Martin gave up at Anthony Rizzo's home run, then another run on a single, a chair base, and a RBI single where Joey Gallo should have had the record, but instead made one of the worst throws I've ever had seen, halfway up the first base line and well over everyone. Jose Leclerc had to get into the game with two outs in a tie game to try to keep things from getting out of control. Leclerc got out of the head and had a scoreless ninth, giving Joey Gallo a chance to redeem himself for his bathing throw. So turning to the bats … Hamels kept the Rangers quiet through the first three innings before experiencing, in the bottom of the fourth, one or more unexpected sequences in recent memory. Hunter Pence had one out single to left, moved to third on a Nomar Mazara single, and then scored on an Asdrubel Cabrera sac flight. Rangers fans were in relief, because at least Texas wouldn't shut out. Logan Forsythe, at first place in the place of Ronald Guzman with lefty starting, worked on eight pitch walk, bringing up Jeff Mathis. Mathis, whose claim to fame is that it can hit, is also a walk, loading the bases for Delino DeShields. It was a good time for DeShields to get its first hit of the year. It was an even better time for DeShields to get his first home run of the year, a go-ahead grand slam off of Hamels, putting Texas back in front, if only for a couple of innings. So moving forward from there … a Pence single and stolen base in the 5th go to naught, and then in the 6th, Mathis homered off or reliever Tyler Chatwood to cut the lead to 8-6. Things were turning around, behind the offensive magic of Jeff Mathis. On to the 7th, and a Rougned Odor walk followed by and Elvis Andrus GIDP made us lament the bad breaks and the fickle nature of baseball. 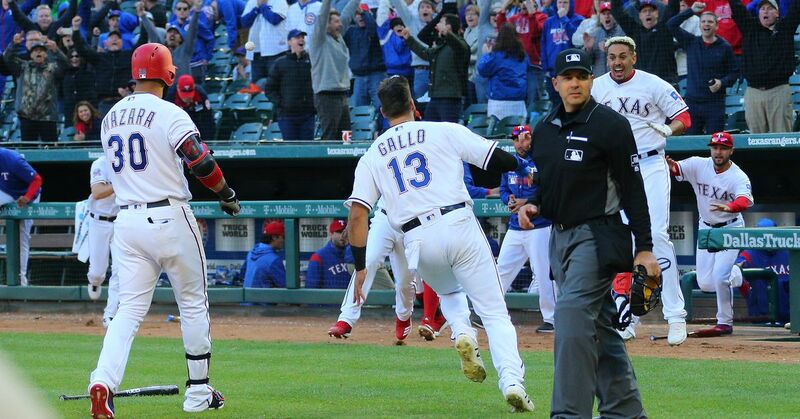 But Joey Gallo hit a two out opposite field single, Pence walked, and with Mike Montgomery brought into the game to face Mazara, Nomar hit a laser that split the outfielders into a right center and bound to the wall, giving him a triple and tying the game. Cabrera followed that up with a two-run bomb, giving Texas that 10-8 lead they gave back in the top of the 8th. So there are, bottom of the ninth, Pedro Strop, former Ranger who was sent to Baltimore for Mike Gonzalez in 2011, before becoming a quality reliever after being shipped to the Cubs, whose goal is to help the Cubs tie the game in the 8th. Gallo goes opposite field, for a moment seemingly for a walk off homer, but ultimately for a double off the left field wall that Ben Zobrist hopes for but couldn't bring down. Shin-Soo Choo, hitting for Pence, grounded in second, moving Gallo to third, and setting the stage for Nomar to be there. Nomar didn't get a chance to be the hero, however, as Strop puts ball in the dirt that bounced away from new catcher Willson Contreras (who came into the game as a pinch runner in the 8th). 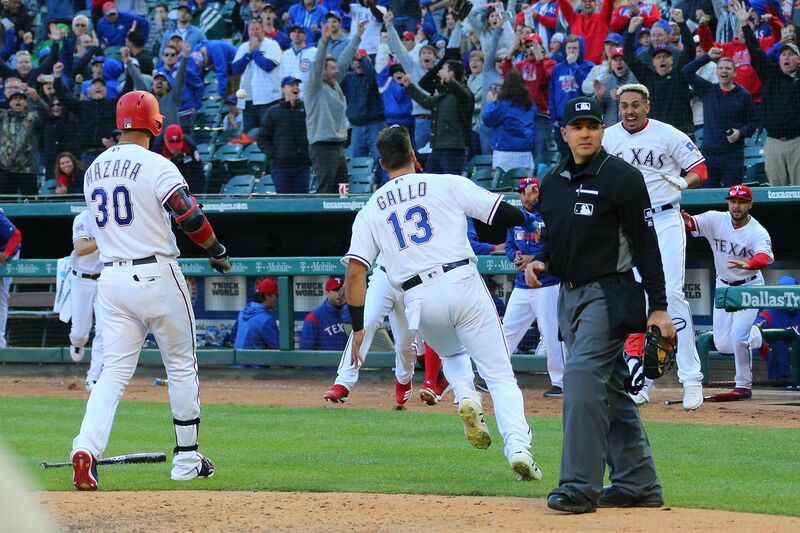 Gallo scored easily, the fans went wild, and the Rangers got to celebrate their first victory of the year. Hey, the Rangers are now 2-1! That's above .500! Yeah, it's just three games, and the pitching has been bad for Texas, but they've won the first series of the year behind strong performances by the young bats.